It's May 1st which means it's time for Currently! Listening: If you read last month's Currently, I was listening/watching the same show...I think I have an official obsession with Big Bang Theory! Bazinga! 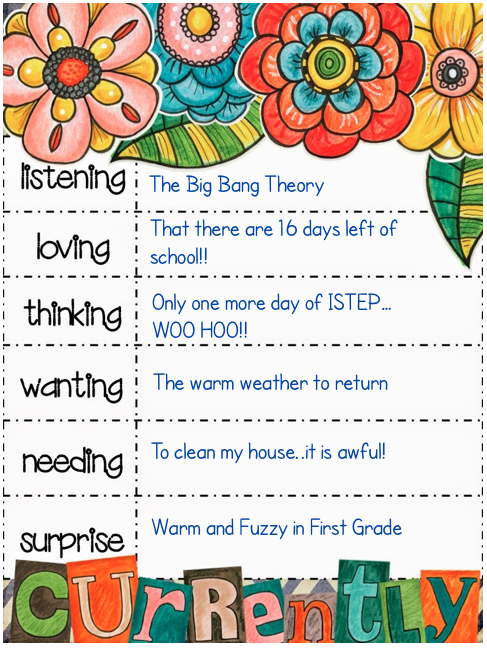 We are in our 2nd round of ISTEP testing and have ONE more day left...we can do this! It's May 1st and I had to kick my heat back on...really?? I know it is hopefully a short lived cold snap, but I'd much rather be kicking on the air. My house is just embarrassing right now...seriously no one can come visit until I have time to clean. No idea when that will be since my Sis-in-law graduates college AND turns 21 this weekend. 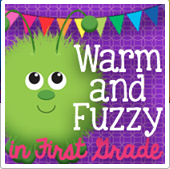 My surprise is...Warm and Fuzzy in First Grade! She is a fellow teacher in my building and a great friend who is just getting started on TPT and the FaceBook world. Check her out and give her a great TpT welcome! I have an obsession with Big Bang Theory too! Love that show! I also wanted to let you know that I mentioned your blog as my "surprise"! I've been using a product of Stephanie's in my class and wanted to give her a shout out. Love your blog! Girlie, now that I have four kids I always require at least an hours notice before anyone comes to visit. Primarily because I need to move all of the not-yet-folded and hung laundry off the couch so he/she can sit down! I just keep telling myself we are making memories here (instead of putting away the laundry).